COLUMBIA, S.C. - The Clemson Tigers announced their 2019 baseball schedule today. With that announcement, the Columbia Fireflies are proud to announce that Spirit Communications Park will play host to a neutral site game between the Tigers and the College of Charleston on Wednesday, March 20 at 7 p.m. The Cougars will be the home team and will be in the third base home dugout. Clemson will be the visitors and occupy the first base dugout. "We are extremely excited for the opportunity to host another premier college baseball matchup at Spirit Communications Park," said Fireflies president John Katz. "It's wonderful to have Coach Holbrook's Cougars back for a second straight season, and we're thrilled to host Clemson for the first time at the home of the 2018 South Atlantic League's Best Playing Surface." "We are so excited about once again being hosted by the Columbia Fireflies and having the opportunity to play in beautiful Spirit Communications Park," said College of Charleston head baseball coach Chad Holbrook. "It's a great opportunity for our players to play one of the best programs in the country at such an incredible venue." Holbrook was named the head coach at the College of Charleston in July of 2017 and made an immediate impact on the program. The Cougars finished with a 36-19 overall record this past spring, an eight-win improvement from the prior season. Holbrook is regarded as one of the nation's top head coaches and recruiters. The former South Carolina head coach guided the Gamecocks to three NCAA tournaments and two Super Regionals during his time as head coach in Columbia from 2013-17. The Cougars baseball program has appeared in seven NCAA tournaments since 2004, including two Super Regionals. 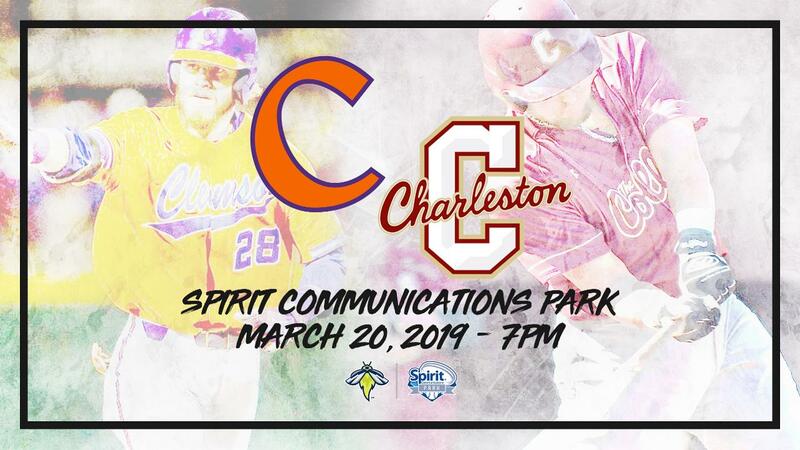 "We are excited to play a great program in College of Charleston in a beautiful ballpark like Spirit Communications Park, " said Clemson head baseball coach Monte Lee. "We have a huge Clemson following in the Midlands and look forward to bringing our team there to play. It's always special for me personally as well to play my alma mater and a program that's very special to me." Lee was a standout at the College of Charleston from 1996-99 and became at the time just the fifth Cougar drafted by a Major League Baseball team (St. Louis Cardinals). Lee was the head coach at the College of Charleston from 2009-15 before becoming Clemson's head coach for the 2016 season. Lee has experienced tremendous success in just three years in Clemson. The Tigers have won more than 40 games and made the NCAA tournament all three years. Lee piloted the program to an ACC conference tournament title (2016) and Atlantic Division regular season title (2018) as well. Few programs can claim the historic success that Clemson can: the Tigers baseball team has appeared in 12 College World Series, most recently in 2010. "Many Clemson fans live in the Midlands and it's just a short drive for our fans," added Holbrook. "It surely promises to be an exciting night!" Both Holbrook (2009-12) and Lee (2003-08) were assistant coaches at the University of South Carolina in the past and this matchup brings them both back to Columbia. This won't be the only time Clemson will play at the 2016 Ballpark Digest Ballpark of the Year. The Tigers and South Carolina Gamecocks will play their annual neutral site game at Spirit Communications Park in 2020 and 2022. On-sale dates for tickets to the matchup between Clemson and the College of Charleston ­­­­will be announced in October. The Columbia Fireflies are the South Atlantic League affiliate of the New York Mets. Winners of Ballpark Digest's Best New Branding and Logo Award in 2016, the Fireflies play games across the southeast and mid-Atlantic regions, including against in-state rivals in Augusta, Charleston and Greenville. The team partnered with the city of Columbia and Hughes Development to construct Spirit Communications Park, a multi-use outdoor sports and entertainment venue at the center of the BullStreet District. The Columbia Fireflies are owned by Hardball Capital, owners of the Fort Wayne TinCaps of the Midwest League and the Chattanooga Lookouts of the Southern League. For more information, visit ColumbiaFireflies.com, or follow the Fireflies on Twitter, Facebook and Instagram. Spirit Communications Park, the winner of the South Atlantic League's Best Playing Field Award and 2016 Ballpark Digest Ballpark of the Year, is a 365-day per year multi-use sports and entertainment venue located in the heart of downtown Columbia, SC. Spirit Communications Park is the home ballpark for the Columbia Fireflies, the South Atlantic League affiliate of the New York Mets. Designed for baseball, concerts, football, soccer and a host of other activities, the venue seats approximately 9,000 for sporting events and up to 15,000 for major outdoor concerts. With 16 luxury suites and a 7,000 square-foot Club Level Lounge, Spirit Communications Park can also host everything from business meetings to wedding receptions, and everything in between. The venue is open 365 days a year and serves as a public park with the wrap-around concourse representing 1/3 of a mile for walkers and joggers. For more information, visit SpiritCommunicationsPark.com.